Blending warm sophistication with modern design, this suite is a perfect home for business or leisure guests, couples and family. Enjoy original arts, books collection and leafy plants. Walking distance to everything downtown Toronto has to offer. 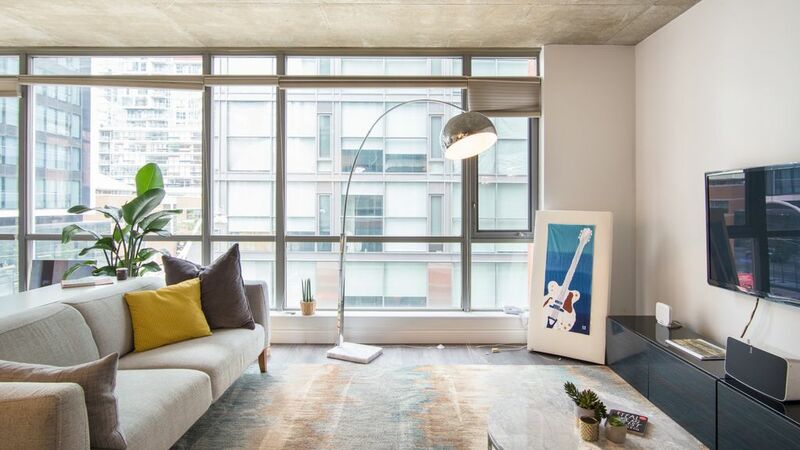 Central location: in the middle of Entertainment and Fashion district, short walk to Chinatown, Harbour Front, Kensington Market, AGO, Queen West, this is the perfect home base. The loft is located in a quiet boutique building. It's steps from the TIFF Bell Light Box, Bay Street, CN Tower, Rogers Centre, King West Village & Queen West shops. The Theatre District or Entertainment District is the name of our neighbourhood. We provide a smart device for guests to navigate the city: Samsung tablet loaded with local tips, city guide, map marked with our favourite restaurants, bars, galleries, food delivery apps, etc. Tran's condo was just as pictured. It is convenient to downtown Toronto &amp;amp; the entertainment district. Lot's of food options are nearby. Our stay was during the coldest, snowiest weather Toronto has had for a long time, so closeness to public transit was appreciated. We didn't cook meals, so can't comment on the kitchen facilities. We were warmly greeting and bid good-bye by members of the team -- Alex &amp;amp; Kostas. Communication by text was always easy &amp;amp; responses were prompt. We were surprised to learn that parking in the building did not include in-and-out privileges, but Tran did her best to find us other off-site options. As it turned out, the weather made driving undesirable anyway. Some form of live TV (cable or antenna) would have been nice. The place was spacious, clean and modern. The sound system was a highlight for me. Check in was easy. Thanks for having me. Great condo, would highly recommend it! Spacious condo, very quiet, best location to experience Downtown Toronto. The apartment was very well equipped and super comfortable. Excellent location as well. Attending a week long conference, this clean and bright, tastefully decorated apartment was a wonderful retreat after a long busy day. It was an easy 12 minute walk, (that was at strolling speed) to the Metro Convention Center, Along the way was a fascinating array of restaurants and shops. A great drugstore/grocery 2 blocks away on King Street, open til 12am, along the way for any emergency forgotten supplies. Before the end of the week, it felt like "my neighborhood." It is a great location for any convention goers, who might enjoy a neighborhood feel. Super appartement located perfectly! Loved the place!